It was a generation ago when Kerry Wood and Mark Prior burned-out their golden arms due to extreme overuse. Baseball set a line of demarcation where going over 120 pitches was taboo. Few pitchers reach that mark these days. In 2000, there were 24 pitchers who pitched over 210 innings. This past season, only 5 pitchers went over the 210 inning mark. What we have learned since then is pitch counts and innings are like a car’s odometer. If you throw too many, your arm breaks down like a piston in an engine. Last year, two pitchers went over 3,400 pitches, and they were Max Scherzer and Justin Verlander. They are throwbacks, but they are also humans. Once again, Scherzer struggled in the month of September. Contrast those statistics with the analytics-driven Los Angeles Dodgers and they did not have a pitcher throw over 2,450 pitches in 2018. The Nationals had 3 pitchers go over 2,900 pitches last season. The Dodgers have been to the World Series the last two years. What do the Dodgers know that the Nationals do not? During the Dusty Baker era, he allowed Gio Gonzalez to throw over 120 pitches in a meaningless late-August game. Baker’s successor, Dave Martinez, allowed Gonzalez to pitch 110+ pitches four games in a row in the month of May. After that, Gonzalez had nothing left and spiraled downward to a 6.53 in his 16 remaining starts with the Washington Nationals. Gio became part of the problem and not the solution as the Nationals lost their hold on first place in early June. Gonzalez went 7 innings against the Padres on May 21st and 7 2/3 against the Orioles on May 28th pitching his third and fourth consecutive games over 110 pitches and he went 114 pitches in the May 28th game. Why? The Nats had both games in-hand. The Nats were up 7-2 in the 5th inning of that May 21st game, and up 3-0 in the 6th inning of the May 28th game. 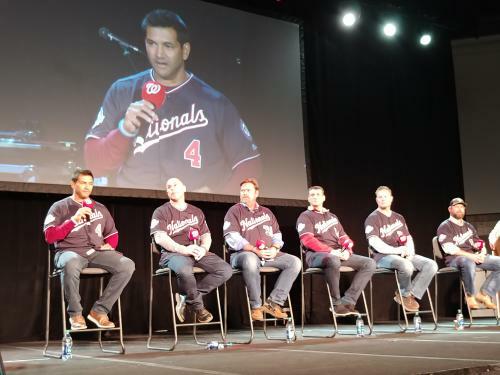 Over this past weekend at the Nationals’ Winterfest, Dave Martinez was talking up how deep his starters went in May. He seemed proud of it like a throwback to a different era, but now we have analytics and commonsense to say “why push it” when you have a big lead. Gonzalez was not an iron man. Some players can handle the grind, but even Max Scherzer has his limits. Scherzer pitched to a 4.24 ERA in September. His odometer hit his limit. Those May starts took their toll as did the April starts on Stephen Strasburg. He went 8.0 innings in his third start of the season and on May 20th he threw 115 pitches. In June, Strasburg was pulled in a June 8th start after the 2nd inning and landed on the DL. Yes, May was a great month, but Gonzalez, Strasburg, and Tanner Roark all had issues afterwards. In the business world, you find out more about your company when things go wrong. Martinez should do the same so it does not happen again. You never want to repeat the mistakes. While Gonzalez is gone, the rest remain, and with the Nationals acquisition of Patrick Corbin, his analytics tell a story that he pitches his best on an extra day’s rest. With extra rest, Corbin went 9-1 last season while going 2-6 on regular rest. Each pitcher has their own analytics and patterns — even Max Scherzer. We can only hope the Nationals embrace the pitcher’s analytics. This entry was posted in DaveMartinez. Bookmark the permalink.